THE underlying issues at the European Patent Office (EPO) have not been addressed at all. They just rotated the face, swapping one Frenchman with another, António Campinos. In a 20-year period it's expected that almost 17 years will be French-led at the EPO. How ridiculous is that? A reader of ours calls it "La famiglia". What is the source for all this? Team UPC. It’s almost as though Wingrove just writes whatever Bristows’ main office tells him to write and the headline says “Constitutional Court ruling rumours spread” as if this “spread” somehow means there’s truth to it; for all we can tell, the only ones “spreading” it are propaganda sites like the one Wingrove writes for. It’s wishful thinking and lobbying; it’s totally baseless and already refuted by the court. There are many aspects to the complaint, presumably 4 main ones; one of the concerns is that UPC judges are controlled by (re)appointment policy, leaving them subservient to crooked circles like Battistelli’s. 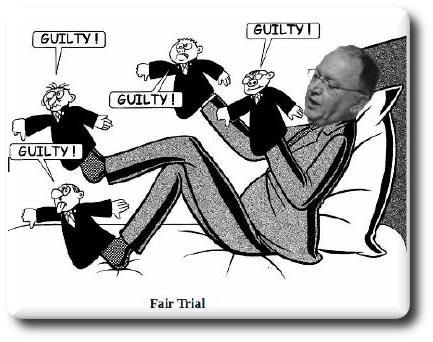 It’s not hard to see what Battistelli thinks of justice and judges. There’s ample documentation of that. It’s almost 2019 and the EPO Boards of Appeal still do not have independence; Campinos has changed nothing after corrupt Battistelli illegally attacked judges (the latest update is rather grim, claiming that Judge Corcoran was admitted into a psychiatric hospital). Six organizations appealed today the European Patent Office’s September decision to uphold US pharmaceutical corporation Gilead Science’s patent on the key hepatitis C drug sofosbuvir. The appeal—filed by Médecins du Monde (MdM), Doctors Without Borders/Médecins Sans Frontières (MSF), AIDES (France), Access to Medicines Ireland, Praksis (Greece), and Salud por Derecho (Spain)—states that the European Patent Office (EPO) should revoke Gilead’s patent because it does not meet the requirements to be a patentable invention from a legal or scientific perspective. The appeal comes exactly five years after sofosbuvir was first approved for use in the US, where Gilead launched the drug at $1,000 per pill, or $84,000 for a 12-week treatment course. The corporation has made more than $58 billion from sales of the drug and its combinations in the last five years. In September, the European Patent Office (EPO) upheld Gilead’s patent on sofosbuvir in an amended form (IPW, Public Health, 13 September 2018). MSF, along with Médecins du Monde (MdM), AIDES (France), Access to Medicines Ireland, Praksis (Greece) and Salud por Derecho (Spain), filed an appeal requesting that the EPO revoke Gilead’s patent. They argue it lacks the patentability requirement “from a legal or scientific perspective,” according to an MSF press release. The filed appeal document was not available at press time. The number of blockchain inventions is mushrooming, and the European Patent Office wants to ensure it handles the increasing patent applications consistently, officials said at a 4 December conference that brought together around 350 patent examiners and practitioners.